There was an immediacy to this story, so we couldn't wait around for TV commissioning editors to give us the go ahead to make this film. So in July 2003, we pulled our resources together and flew out to Ethiopia. Together with our associate producer Oistein Thorsen, we travelled to the southern region and found coffee farmers, once the backbone of the country, being impoverished by the fluctuations of the global coffee market. Thousands of families were losing money and fast becoming bankrupt. The situation directly impacted the 15 million people in Ethiopia who depend on coffee for their survival as well as the country's economy that derives 67% of its export income from coffee. It was not just in Ethiopia that this was happening, but also across the world, where farmers were being crippled by low coffee prices. In Ethiopia's capital we met Tadesse Meskela, the manager of the Oromia Coffee Farmers Co-operative Union that represents over 74,000 farmers. He was trying to bypass the international trading system by finding buyers who would pay more for his high quality coffee. For him his work was more than just a job. He was passionate and determined to improve the lives of the thousands of farmers he represents. We spent several days with Tadesse in the capital and he took us to many places including a tour through the processing plant where hundreds of women work for eight hours a day picking out a few bad beans from the thousands of good ones before they are exported. These women were a key link in the coffee chain and were being paid merely half a dollar a day - a recurrent theme of today's globalisation. Tadesse's work, his commitment, and the enormity of the situation and task he faces were genuinely awe inspiring - others were replicating his work in the context of the world trade talks in Mexico. After our first shoot in Ethiopia we flew straight to Cancun to film the meetings of the World Trade Organization (WTO), where pivotal decisions were being made in setting the trade rules that undermine Africa's economy and development. Whilst decisions made at the WTO do not affect the coffee price directly, it was crucial to widen the scope of the film to remind people that in addition to coffee farmers, millions of producers of other commodities are also struggling to survive in the global market. It was at the WTO that this struggle for fairer international trade rules was being played out. Ministers from across Africa packed out the conference centre calling for an end to subsidies: Rich countries pay their farmers $300bn in subsidies every year which cripples the ability of developing countries to compete on the international market. At the WTO, ministers from across Africa packed out the conference centre calling for an end to subsidies. African ministers also expressed how they wanted a fairer system of trade rather than more aid. A 1% increase in the continent's share of world trade would in itself generate $70 billion per year - five times more than what the continent now receives in aid. Despite the rhetoric of Europe and the US, there was little or no change in the status quo. As calls for change went unheard - dramatic events took over. For the first time developing countries refused to be forced into signing agreements that were against their interests - and the WTO talks completely collapsed. Since Black Gold was completed the entire "Doha Development Round" which was supposed to put developing countries at the centre of world trade talks has collapsed and is unlikely to be restarted. A system of trade that is rigged in favour of rich countries still continues. After Ethiopia and Mexico we returned to London and teamed up with Christopher Hird, our Executive Producer at Fulcrum Productions, to set about financing the rest of the project and making a rough cut. We managed to bring on board an extremely talented editor, Hugh Williams, who has over 15 years of experience in international documentaries. We then spent several weeks in the edit suite developing the Black Gold story. Through the rough cut, we soon realised that in order to develop the thrust of the narrative we would need to return to Ethiopia to spend more time with the coffee farmers and also our main character Tadesse Meskela. In order to emphasise the connection between the consuming and producing worlds we also wanted to frame the coffee farmers story in the context of the western coffee consuming world - and scheduled trips to Seattle, New York and Italy. After receiving a grant from The Sundance Documentary Film Program we soon found ourselves back in the coffee areas of southern Ethiopia. There we found coffee farmers digging up their coffee trees and growing instead the leafy narcotic, chat. In Italy, we filmed the Ethiopian coffee beans arriving at the Illy coffee company and captured the Italian espresso culture. In New York, we filmed the trading floor of the commodities exchange where the price of coffee is established, and in Seattle we followed Tadesse to the largest coffee trade show in the world, where he tried to find new buyers for his farmers' coffee. We also filmed the World Barista Championship where hundreds of baristas around the world gathered to compete in making the best lattes and cappuccinos. While in Seattle, we had hoped to interview a spokesperson from the Starbucks Coffee Company at their global headquarters whilst we were filming at the Speciality Coffee Association of America's trade show which Starbucks were sponsoring. Months before we left London we had tried making contact with them but hadn't had any success. So we approached the head of global press at a panel about "communicating to the media." Despite promises we received from the head of global press that we would be able to interview an executive - the promise never materialised. None of our phone calls were returned and we left Seattle without the interview. Together with Starbucks, all the other major coffee companies which we approached - Sara Lee, Proctor & Gamble, Kraft and Nestle - declined invitations to be interviewed for Black Gold. By July 2005, we were back in London working on the final cut. A few weeks later we were awarded a place on the Sundance Documentary Composers Lab. Set in the mountains of Utah, we took part in an intensive workshop to develop musical ideas for Black Gold. It was here that we met Andreas Kapsalis who immediately connected with Black Gold and subsequently went on to score the film. While our editor Huh was busy crafting the final cut in London, Andreas uploaded his music files onto the internet from his studio in Chicago which Hugh downloaded into his edit suite. 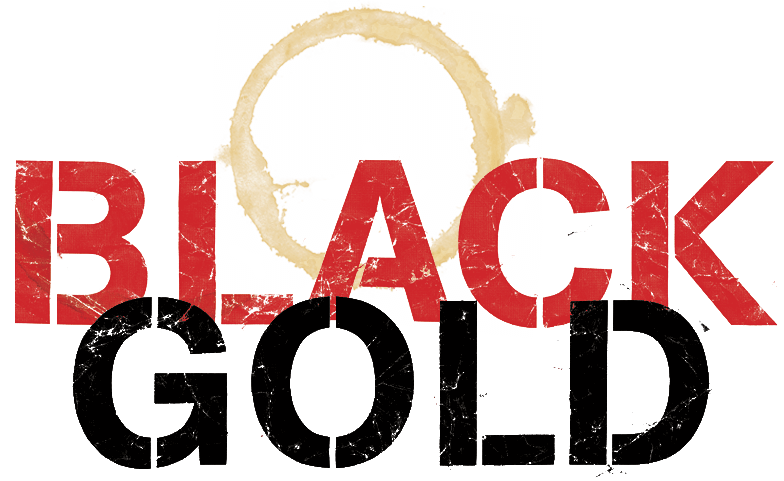 Everything came together just in time for our world premiere at the Sundance Film Festival, and Black Gold has been making waves around the world ever since.